Houston Texas has been home to the petrochemical industry for decades. Its rich oil grounds produce tens of millions barrels of oil every year. In order to process the oil it has refineries and chemical plants across the region. Intercontinental Terminals Company (ITC) is a large chemical storage site located in Deer Park Texas. Deer Park is located south east of Houston in Harris County, and according to 2010 U.S. Census has a population of 32,010. These petrochemical plants are generally safe, but the massive fire that broke out on March 17 at ITC shows how dangerous these refineries and chemical storage plants can be. Over 9 million pounds of benzene was released during this fire and affected thousands of people nearby. Many of these victims sought treatment at a make-shift treatment center. Benzene vapors were measured near the facility reached 190.68 parts per billion, this exceeded Texas Commission of Environmental Quality’s maximum safe exposure of 180 parts per billion. Most people affected by this fire complained of respiratory problems, headaches, stomach problems and nausea. Many victims are now contacting lawyers wanting to hold ITC accountable; there could be thousands of lawsuits coming in the next few months. National Injury Help is now accepting lawsuit claims for individuals who were affected by this chemical fire. Helping people who suffered respiratory problems, throat issues, eye problems or other health problems associated with benzene exposure. We expect large cash settlements from these chemical fire lawsuits. If you live or work anywhere near Deep Park and were exposed to toxic benzene fumes contact us today. We intend to hold ITC or any other chemical storage facilities responsible for this public health risk. Texas Attorney General Ken Paxton has now filed a lawsuit against ITC stating the company has violated state clean air acts. Deer Park Mayor Wants Answers and Regulations. Texas air pollution laws are not often enforced. According to a report by The Union of Concerned Scientists, Manchester is frequently exposed to toxic chemicals including 1,3-butadiene, benzene, ethylbenzene, styrene, toluene, and xylene. Second Houston Chemical Plant Fire Erupts – More Toxic Fumes Covers Area. 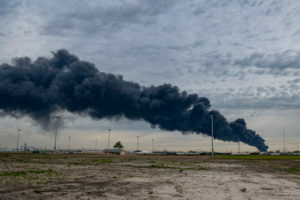 On Tuesday April 2, yet another chemical plant fire happened at the KMCO LLC plant in the town of Crosby Texas, located about a half hour away from Deer Park. This time a worker was killed on site. All residents within a 1-mile radius of the plant were ordered to shelter in place, according to the Harris County Sheriff’s Office. This KMCO plant fire appears to have released 2,300 pounds of toxic chemicals including isobutylene and toluene into the air. Both are considered health risks. How to File a Chemical Plant Fire Lawsuit Claim. National Injury Help makes it easy to file and start a lawsuit claim against ITC. Were you affected by this chemical fire? Are you experiencing any signs of benzene exposure such as respiratory problems, headaches, stomach problems or nausea? Some may experience confusion, dizziness, rapid or irregular heartbeat. If so take time to protect your rights, ITC will be held accountable for this tragic chemical fire. Anyone who lives or works near Deep Park could qualify for this chemical storage fire, our lawyers are actively seeking victims. Call us directly at 1-800-214-1010, or use the contact form on this page. 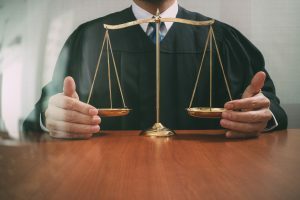 Houston Texas Chemical Fire Lawsuit Claims & Settlements page updated on April 17, 2019.